From vegetable farm to international airport! You never know where the Italian South will crop up! I made my first visit to Seattle’s Museum of Flight last weekend, with some friends from out of town. It’s a beautiful facility directly adjacent to Boeing Field, Seattle’s first international airport. 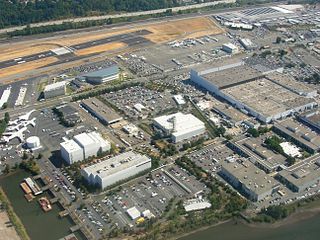 In the photo, the museum buildings are nearest to the airfield, and some of Boeing’s buildings are in the foreground. Turns out, in the late 1920s when the Boeing company was in its early stages, William Boeing was looking around the country for another location because Seattle did not have a suitable airport to meet the company’s needs. When news of the search got around, immigrant farmer Giuseppe “Joe” Desimone made Boeing an offer he couldn’t refuse–a big tract of land south of downtown Seattle, for one dollar, to keep the company in Seattle. Today the airport is bordered by dozens of Boeing facilities, and both the company and the airport continue to play significant roles in the life of Seattle. Very cool!I thought, and made note of his name to learn more about him for a blog post. We finished our tour, and continued sightseeing, including lunch and a wander through Pike Place Market. And guess what!? Joe Desimone was one of the earliest participants in the Market, gradually buying shares until he owned the place. His family remained in ownership after Joe’s death in 1946, until the Market became publicly owned in the 1970s. Joe Desimone taking vegetables to market. 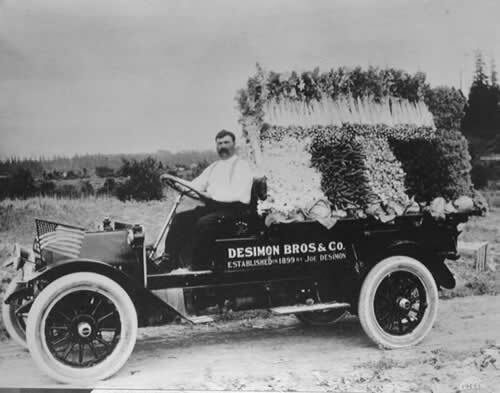 Joe immigrated from the Naples area at the age of 18 in 1898, and by 1910 was a thriving farmer in King County. His stall features prominently in this historic video footage of Pike Place Market–you can see his name on the sign at about the one-minute point, and again at three minutes into it, but I don’t know which of the men in the movie is him. This entry was posted in History, Travel and tagged Boeing, history, Joe Desimone, Museum of Flight, Naples, Pike Place Market, travel. Bookmark the permalink. ← Stracciatella Soup: What could be easier? What a delightful bit of history! I really enjoyed it. One question, why is his name spelled without the e on the end as in Desimon on the side of the truck and in all other places we see the e? I don’t know why the E was dropped on the sign on the truck–I looked him up in the 1910 census and it is spelled with an E there. He immigrated in 1898, and by 1910 his household already included four or five farm laborers working for him. along with his wife and three young children.